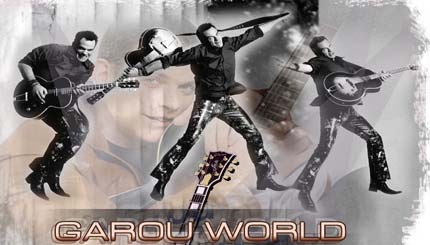 Garou (born 26 June 1972) is a French Canadian singer from Sherbrooke, Quebec. Born Pierre Garand, he was discovered by Luc Plamondon while singing American blues tunes in a Sherbrooke bar. He was drafted by Plamondon to play the role of Quasimodo in his musical Notre-Dame de Paris, which made him a star in France. After the musical, he launched a successful international pop music career in Quebec, France, and many other European countries. In 2000, Garou recorded a duet with Celine Dion called "Sous le Vent." For his first album in English, Garou collaborated with some of the biggest names in music. The single "Stand Up" was written by Rob Thomas. He also sang the song "First Day of My Life", which was a big hit all over Europe in 2006 for former Spice Girl Melanie C, by Guy Chambers and Enrique Iglesias. Garou has a daughter named Emelie, with his ex-girlfriend, Ulrika, a former model. He is currently engaged to French singer Lorie. He played the role of Quasimodo in the stage musical Notre Dame De Paris and appears on both the French and English soundtracks. Garou recently performed the Jean-Pierre Ferland song "Un peu plus haut, un peu plus loin" (A Little Higher, A Little Farther) at the 2010 Winter Olympics opening ceremony in Vancouver, British Columbia.